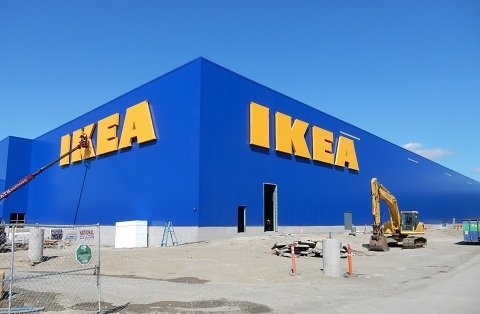 RENTON, Wash.--(BUSINESS WIRE)--IKEA, the world’s leading home furnishings retailer, today announced plans to install solar panels atop the relocated Seattle-area store under construction in Renton, WA. Installation will begin this fall, with completion expected in winter for the largest rooftop solar array in the State of Washington. The store’s 244,504-square-foot solar array will consist of a 1.18 MW system, built with 3,420 panels, and will produce approximately 1,319,000 kWh of electricity annually for the store, the equivalent of reducing 927 tons of carbon dioxide (CO2) – equal to the emissions of 196 cars or providing electricity for 137 homes yearly (calculating clean energy equivalents at www.epa.gov/energy/greenhouse-gas-equivalencies-calculator). Since its 1943 founding in Sweden, IKEA has offered home furnishings of good design and function at low prices so the majority of people can afford them. There are currently more than 370 IKEA stores in 47 countries, including 41 in the U.S. IKEA has been ranked among “Best Companies to Work For” and, as further investment in its coworkers, has raised its own minimum wage twice in two years. IKEA incorporates sustainability into day-to-day business and supports initiatives that benefit children and the environment. For more information see IKEA-USA.com, @IKEAUSANews, @IKEAUSA or IKEAUSA on Facebook, YouTube, Instagram and Pinterest.